Memory has long been a subject of fascination for poets, artists, philosophers and historians. This timely volume, edited by Siobhan Kattago, examines how past events are remembered, contested, forgotten, learned from and shared with others. Each author in The Ashgate Research Companion to Memory Studies has been asked to reflect on his or her research companions as a scholar, who studies memory. The original studies presented in the volume are written by leading experts, who emphasize both the continuity of heritage and tradition, as well as the memory of hostilities, traumas and painful events. Comprised of four thematic sections, The Ashgate Research Companion to Memory Studies provides a comprehensive overview of the latest research within the discipline. The principal themes include: ¢ Memory, History and Time ¢ Social, Psychological and Cultural Frameworks of Memory ¢ Acts and Places of Memory ¢ Politics of Memory, Forgetting and Democracy Featuring contributions from key thinkers in the field, this comprehensive volume will be a valuable resource for all academics and students working within this area of study. 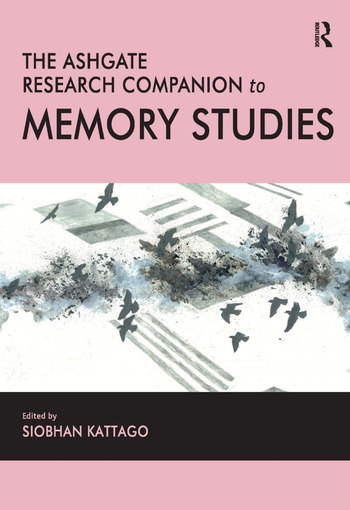 Contents: Introduction: memory studies and its companions, Siobhan Kattago. Part I Memory, History and Time: History as an Art of Memory revisited, Patrick H. Hutton; Chateaubriand, selfhood and memory, Peter Fritzsche; Dialectical memory: the intersection of individual and collective memory in Hegel, Angelica Nuzzo; Spectral phenomenology: Derrida, Heidegger and the problem of the ancestral, Hans Ruin. Part II Social, Psychological and Cultural Frameworks of Memory: Continuity and innovation in the art of memory, Luisa Passerini; From collectivity to collectiveness: reflections (with Halbwachs and Bakhtin) on the concept of collective memory, Alexandre Dessingué; A unified approach to collective memory: sociology, psychology and the extended mind, William Hirst and Charles B. Stone; Mannheim and the sociological problem of generations: events as inspiration and constraint, Vered Vinitzky-Seroussi; Semiotic theory of cultural memory: in the company of Juri Lotman, Marek Tamm. Part III Acts and Places of Memory: Travel companions, Mieke Bal; ’Forked no lightning’: remembering and forgetting in the shadow of Big Ben, Stuart Burch; Written in stone: monuments and representation, Siobhan Kattago; Theories of memory and the imaginative force of fiction, Julie Hansen. Part IV Politics of Memory, Forgetting and Democracy: Memory and methodological cosmopolitanism: a figurative approach, Daniel Levy; Hannah Arendt and Thomas Paine: companions in remembering, forgetting and beginning again, Bradford Vivian; Interactions between history and memory: historical truth commissions and reconciliation, Eva-Clarita Pettai; Post-Stalinist Russia: memory and mourning, Alexander Etkind. Afterword, Jeffrey K. Olick; Index. Siobhan Kattago is Senior Research Fellow in Philosophy at the University of Tartu, Estonia. She is the author of Ambiguous Memory: The Nazi Past and German National Identity and Memory and Representation in Contemporary Europe.